Anthony Carter signing autographs in 1993. Anthony Carter (born September 17, 1960) is a former American football wide receiver. He finished his college career as the University of Michigan's all-time leading receiver, and played professionally for thirteen years in the United States Football League and the National Football League. He is also known as 'AC'. Anthony "AC" Carter played for Michigan from 1979 to 1982. Although the Wolverines employed an offense that relied mostly on its running backs, he was one of the most productive receivers in the school's history. Standing five feet, eleven inches tall and weighing only 160 pounds, Carter relied on his speed to make plays, and provided an effective counterpoint to coach Bo Schembechler's running game plan. In addition to his duties as a receiver, he was also the team's kickoff and punt returner for most of his career. During his freshman season Carter was used sparingly. He caught more than two passes in a game only once that season, but made the most of it when the ball was thrown to him. Seven of his seventeen receptions were touchdowns, and he averaged 27.2 yards per catch. His 45-yard TD catch and run against Indiana as time ran out to give Michigan a 27-21 victory is considered one of the greatest plays in Michigan football history, and the radio call by the legendary Bob Ufer is also considered a classic. In that game, Lee Corso's Indiana Hoosiers had tied it up with about a minute to go. At that time, college games could end in a tie, and Michigan had a 6-1 overall record, 4-0 in the Big Ten. While a tie was essentially as good as a win from Indiana's perspective, a tie was as good as a loss from Michigan's perspective. On the ensuing drive, Michigan was only able to get to the Indiana 45-yard line with time fast running out. Things looked grim, but with six seconds remaining, Carter told quarterback John Wangler in the huddle, "Hey, Johnny. Throw the ball to me. I'm going to be open." On the next play, Carter, sprinting left to right, met Wangler's pass in a seam over the middle at the Hoosier 25. He made a one-step cutback to his left to avoid one tackle and slipped another tackle at the 5-yard line before bounding into the endzone after time had expired. By his sophomore year, Carter was the Wolverines primary option at receiver. That season he became the first second-year player to be voted Michigan team Most Valuable Player. A three-time All-American, he was named Big Ten Conference MVP his senior season, and finished fourth in voting for the Heisman Trophy. He was the third NCAA Division I FBS athlete to total 1000 career yards on both kick returns and punt returns. He holds the NCAA career record for highest average gain per play (Min. 5,000 yards, 275-374 plays, 5,197 on 298). On December 12, 2014 the Big Ten Network included Carter on "The Mount Rushmore of Michigan Football", as chosen by online fan voting. Carter was joined in the honor by Charles Woodson, Tom Harmon, and Desmond Howard. His average of 17.4 yards-per-play was an NCAA record. Upon graduating from college, Anthony Carter chose to play in the upstart USFL, rather than in the NFL. The league employed a territorial draft, aimed at sending players to teams whose fans were already familiar with them. Because of this unique system, the Michigan Panthers were allowed to select Carter prior to the league's traditional draft. 1983 was Carter's first season with the Panthers and one of his most successful as a professional. Although the team started 1-4, they finished the regular season 12-6 and went on to defeat the Philadelphia Stars to win the first USFL championship. With his team behind late in the fourth quarter, he scored the game-winning touchdown on a 48 yard pass from Bobby Hebert. He finished the game with nine receptions for 179 yards. For the season, he gained 1,081 yards on 60 catches, nine of them touchdowns. Carter's 1984 season was cut short after only six games when his arm was broken in a game against the San Antonio Gunslingers. Before the 1985 season the Panthers merged with the Oakland Invaders. In his last USFL season, he led his team in receiving yards (1,323), receptions (70), and receiving touchdowns (14). After the 1985 USFL season, Carter signed with the NFL's Miami Dolphins, who drafted Carter back in 1983 in order to secure his NFL rights. However, he was traded to the Minnesota Vikings before playing a game with the team. He led the Vikings in receptions five of his first six seasons with the team, and was selected to the Pro Bowl in 1987 and 1988. In the 1987 season, Carter helped his team reach the NFC championship. He set an NFL playoff record (since surpassed) with 143 punt return yards in their wildcard win over the New Orleans Saints, and caught 10 receptions for a then NFL playoff record 227 yards, along with 1 carry for 30 yards and two punt returns for 21 in the Vikings 36-24 upset win over the 13-2 San Francisco 49ers in the divisional playoff round. The 642 all purpose yards he gained in the 1987 playoffs remain a single postseason record. The following season, he caught 4 passes for 102 yards in a 28-17 wild card round win over the Los Angeles Rams. 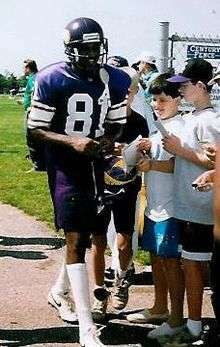 Although Cris Carter became the team's number one receiver in 1991, Anthony Carter remained an effective offensive weapon through 1993, his final season with the team. The final two years of Carter's pro career were spent in the same state where it began, this time with the Detroit Lions. Most of his time with the Lions was spent attempting to come back from injury. He played in only four games in 1994, and failed to catch a pass in 1995. ↑ "2009 Division I Football Records Book: Football Bowl Subdivision (FBS) Records" (PDF). National Collegiate Athletic Association. p. 20. Retrieved 2010-07-09. ↑ "2009 Division I Football Records Book: Football Bowl Subdivision (FBS) Records" (PDF). National Collegiate Athletic Association. p. 21. Retrieved 2010-07-09.